DIRECT OCEANFRONT! - AWESOME REVIEWS!! - SUPER CLEAN -BEST PLACE EVER! BOOK NOW! 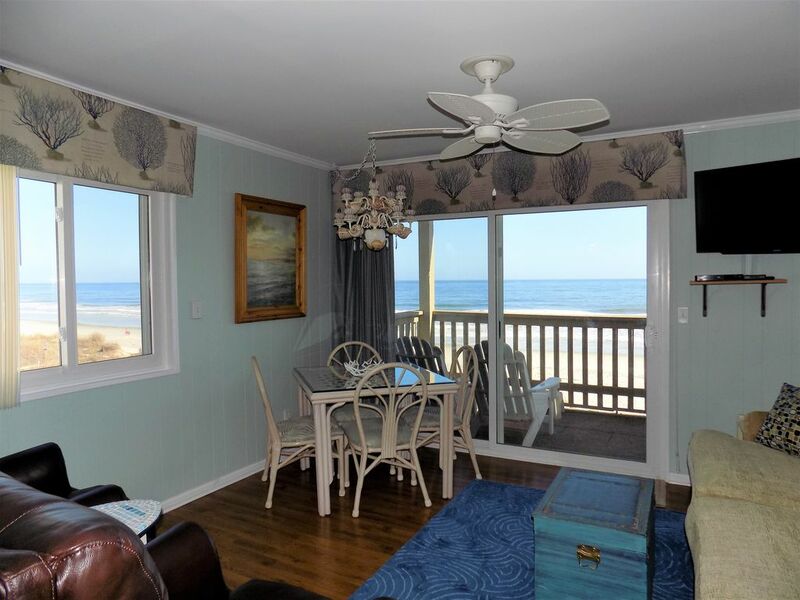 Comfortable Relaxed Beach Interior DIRECT OCEANFRONT. Directly facing the ocean and on the beach with just 2 flights up to give you an incredible unobstructed view of the Beach & Ocean. Decorated with Laminate Hardwoods throughout. Immaculate with a Spa like atmosphere. DIRECT OCEANFRONT, nothing between you and the Ocean except Beach. Queen Master Bed & a Lazy Boy Queen Sleep Sofa. Two Recliners facing the Water. Washer/Dryer in Condo. Furnished with very nice Linens, sheets, towels, and 3 BeachTowels. Plenty of Closet Space. Two TV's - Great Room has large New 37" flat screen TV and DVD. Second flat screen TV in Master Bedroom. You are Directly on the Beach and Ocean facing the water. Bathroom Vanity with Sea Glass tile Mirror. Pool is in view from the side of the balcony and an interior window. Large 6 x 14 Deck has extremely comfortable two Adirondack Lounge Chairs, two Adirondack Pub chairs and table. Kitchen is FULLY equipped, numerous small appliances including Cuisinart Thermal Coffee Pot and Grinder Crock pot & all cooking utensils. Fabulous location very close to Barefoot Landing, Alabama Theatre, House of Blues, Greg Norman Australian Restaurant, Oscars, Wild Wings, Taco Mundo, Benny Rappas (homemade Italian), Joes Restaurant, Hamburger Joes, Crab Catchers, Seafood Restaurants, Entertainment, Shopping, just minutes from Tanger Outlets, Coastal Grand Mall, HomeGoods, TJ Maxx, Marshalls and more. Owner's live near this area and take very good care of the Property. You will want to make this a Regular Vacation Choice each Year. Owners are a South Carolina couple in their 60's who love to travel and stay at the beach and ocean as much as possible. Owners live close to this area and keep it very well maintained. They love this place! Best Purchase we ever made! We had always wanted something right on the ocean. Awesome Oceanfront location with a Quiet Beach with very little traffic. Easy to get to from the New Hwy 22. We like this building being only 3 stories tall with only 21 units and is not located close to the Tall High Rises. Plenty of spacious room on the Beach! This Building has a fantastic Homeowner's Association that keeps the property in immaculate condition. They are a terrific group of people to socialize with also. This is the most relaxing place you could ever stay. Some people never leave the balcony the entire time they are here. Beautiful beach for walks and a clean beautiful ocean for swimming. Showers by the pool and by the beach walk-way. Great restaurants nearby and a winery down the street with concerts & bonfires on the weekends. You simply could not find a more comfortable, fully equipped condo anywhere else that is also direct oceanfront. AWESOME! Plenty of towels, towel rods, and hooks for hanging towels and bathing suits. Storage Cabinet on Wall and Storage Under Sink Vanity. Very organized. This Unit is Directly Facing the Beach and Ocean. As direct OCEANFRONT as you can get. Unit is DIRECTLY facing the Ocean. As OCEANFRONT as you can get. Only the sand between you and the Ocean. This Unit is Directly facing the OCEAN. OCEANFRONT!!! Building is oceanfront, our condo unit is oceanfront and the balcony is oceanfront. You are totally on the Ocean. Large Beach Area and Directly facing Ocean. TOTALLY OCEANFRONT! Nothing between this Unit and the Ocean except Sand. Linens Provided,Queen Sheets, Pillows & Pillowcases, Bath Towels, Kitchen Towels & Dish Cloths or you may bring your own. 3 Beach Towels in Unit. Cleaning Service will leave clean linens. Parking under building and beside building. Parking lot on condo property. Spices in unit. Please replace anything you use up. Everything you could possibly need. Grilling Utensils for grilling outdoors. Crock Pot, Wine bottle opener. Wine Glasses, Margarita glasses, Martini Shaker, Ice Tea Pitchers, Tea Pot and MORE! Glass top dining table with seashell chandelier handmade by owner. Extra touches by Owner throughout. Spectrum/Time Warner and wireless internet. Wi-Fi is Free. Balcony with pub table, 2 pub Adirondack chairs and two Adirondack lounge chairs. Balcony deck directly faces the ocean and beach. Patio by the Pool. Deck/Balcony on Unit directly facing the Ocean. Outdoor Showers by the Pool, Shower by the Beach, plenty of lounge chairs and sunbathing space. Larger Beach Area than most Condo buildings on beach. Larger Deck than most 1 bedroom condos. Corner Unit with fantastic direct ocean view. As Direct Oceanfront as you can get. Directly on the Beach and Directly facing the Ocean. We very much enjoyed our stay in this well-tended and calming space. It was as promised ... a direct oceanfront location, a patio from which to enjoy the sight and sound of the ocean, a kitchen well enough stocked to prepare your own meals, and comfortable living room furniture and bed. This place is great- you will not be disappointed! I cannot say one negative thing about this property. Wanda was very prompt answering any questions that I had, even before booking. She makes sure that your stay there is as carefree & relaxing as possible. The condo itself was very clean and has everything you need to feel at home. It’s just steps to the beach & close to popular attractions. And the view was amazing!! We can’t wait to go back! We're still striving to keep the condo the best vacation spot. We love all the repeat vacationers we've had. Thanks for the great reviews. Excellent. We are coming back. It's awesome to have such a following of great repeat renters! We're always striving to keep the condo as nice as possible. Our stay at Wanda's Condo was fantastic. All of our question prior to renting were answered in a quick and detailed manner. The location is fantastic and it is steps away from the Atlantic Ocean. The Sunrise views from the Deck were outstanding and the Condo is equipped with all of the needed accessories for a week away from home. I would highly recommend this unit and we hope to return next year. Thanks Wanda for the upkeep of your Condo. It really felt like home and we did not want to leave. So happy you guys had a great vacation. Thanks for the great review. This condo has a great view. We loved drinking our coffee out on the balcony in the mornings. My family and I stayed here for a week. The beach in front of this condo seemed a little less crowded then further down on the beach. We met and talked to other families that were staying here and everyone was very nice. The condo itself was very clean and had anything and everything you could need. We definitely enjoyed ourselves and we will definitely be staying here again. So glad you had a great vacation. Every year we strive to make it better and better. Thanks for the great review. Location, location, location. We thoroughly enjoyed your beach retreat unit. It was clean, bright and we loved the ocean themes that really reinforced the beach life. The views and having morning coffee or an evening drink made on the deck was a highlight. We loved it. Direct Oceanfront Unit. Best Location Ever! Winery Tour nearby in Little River with Concerts on some weekends and bonfires in the Winter. Across from Barefoot Landing. Incredible location with Restaurants everywhere, putt putt, antique stores, theatres, plenty of shopping centers, grocery stores, etc. yet the beach for this area is quiet and relaxing. Cancellation Policy - If you have an emergency and need to cancel, please do so 90 days prior to check in date. Any cancellation must be made 90 days out and all but $100 is refunded. Cancellations 60 to 90 days - all but $200 is refunded and less than 60 it is non-refundable since we may not be able to fill it. Lock Box info sent when final payment clears.